Betel leaves were once dubbed green gold. But farmers do not find betel farming lucrative anymore. Besides low demand, it is the rising input cost, primarily for irrigation, that is discouraging betel farmers. Since it is a tropical plant, growing betel in the subtropic climate of India requires extra care and attention. So farmers grow it in a greenhouse where they can maintain humidity of 40-80 per cent, and temperature between 15oC and 40oC. The greenhouse, which looks like a rectangular hut, is typically made up of bamboo and cane or covered from all sides by mats of dried coconut leaves. The roofing is of hay, dried grass and coconut leaves. Inside the enclosure, rows of thin bamboo or jute sticks are placed, usually a foot apart, each offering support to a single vine. As it grows, it is entwined on the stick. To keep the sand moist and maintain the inside temperature and humidity, farmers need to sprinkle water regularly, at least four times a day in the summer and twice a week in winters. Farmers say the cost involved in watering has become a major hurdle in betel farming lately. “Earlier, water was not a cost to bother as it was available year round,” said Lalta Prasad Chaurasia of Mahoba. His son spends Rs 30,000 a year to water an acre (0.4 ha) of farm. With rainfall becoming increasingly erratic, ponds do not hold sufficient water all year round, said Balai Mohanty, a betel farmer from Bhograi. In summer he depends on borewells, as deep as 12 metres, to water his two farms of 12 decimals each. This pushes up the diesel cost. Betel farmers in Jaleshwar estimate watering accounts for 20-30 per cent of the total cost (see tables). Recent increase in the cost of labour and farm inputs has added to betel farmers’ woes. For instance, to put up a betel greenhouse, a farmer needs stacks of bamboo sticks. Earlier, state governments used to provide bamboo at subsidised rates. But the practice has stopped in most states. Farmers say buying bamboo from the market costs them three-four times the subsidised price. Besides, they are not always available in the market. Other raw materials like cane and jute sticks have also become scarce and hence expensive. Betel farmers of Jaleshwar estimate the cost of constructing a betel garden has increased by more than three times in the past decade—from Rs 5,500 to Rs 17,500. Add the increased cost of labour to this. Betel cultivation is labour-intensive. A betel leaf garden requires frequent watering, plucking of leaves, applying fertilisers and pesticides and maintenance of the enclosure. Low demand and high-input costs are already driving betel farmers to switch from organic manure to chemical fertilisers and growth hormones. Farmers from Khejuri block of East Midnapore say using organic manure, usually a concoction of cow dung, vermin compost and oil cakes of mustard, groundnut and neem seeds, costs them Rs 36,000 per acre (0.4ha). Chemical fertilisers bring down the cost by less than half. It also helps them harvest the first batch of leaves within a month of setting up the garden instead of two-three months. Weekly plucking goes up from twice to three times. Most betel farmers in West Bengal shifted from organic to chemical fertilisers after cyclone Aila ravaged betel producing districts of East Midnapore and 24 Parganas in 2009. Heavy downpour and gusty winds brought by Aila destroyed most betel gardens. A basket of 20,000 leaves, which would have otherwise sold at Rs 8,000- Rs 12,000, sold for Rs 40,000 once trading resumed, recalled Nadu Gopal Das, a betel farmer from Khejuri. Farmers, who were rebuilding gardens, started using chemical fertilisers profusely to forge a profit from the high price. But parting with organic method has proved to be a loss-making path. Traders at Mechheda auction hub complain the quality and longevity of the pungent Bangla patta has reduced lately. According to trade association member Chandi Charan Samanta, “With organic cultivation betel leaves stay fresh for almost 15 days. But with more use of chemicals they are turning yellow in just seven days. This is the reason a basket of 20,000 organic leaves can command a whopping Rs 51,000 compared to the chemical variety that hardly fetches Rs 19,000.” Still most farmers are opting for cheap chemical farming because it helps them quickly recover the high initial investment and minimise the loss in case of a slump in the market. D V Amla, deputy director of the National Botanical Research Institute (NBRI) in Lucknow, said in 1981 the institute worked with Mahoba farmers on a government-sponsored project to improve betel leaf cultivation. They had offered suggestions like using plastic sheets instead of thatched roofs. But the government scrapped the project due to shortage of funds in 2000. 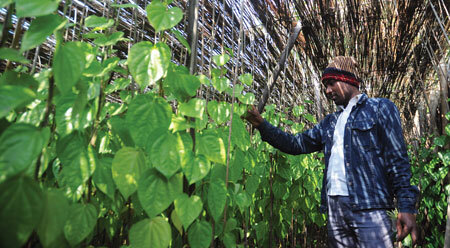 In February this year, the state horticulture department submitted a proposal to improve betel cultivation. It has sought Rs 15 crore as financial assistance to betel farmers in Uttar Pradesh. Till date, Madhya Pradesh and Bihar are the only states offering financial assistance to betel farmers. Madhya Pradesh offers Rs 30,000 or half of the cost of setting up a farm to each betel farmer and is sponsoring a betel vine project. The impact is evident. Area under betel has gone up from 694 ha to 766 ha in five years. In Bihar’s Navada district, the horticulture department has been disbursing Rs 15,000 per half-a-decimal farm since 2008-09. Area under cultivation has since increased by 40 ha (see map). P Guha, professor of agriculture and food engineering at IIT Kharagpur, West Bengal, considers betel a suitable cash crop for small farmers, despite high input needs. One can set up a betel garden on a three decimal area. A farm of 10-15 decimals can provide considerable net profit for a family of five, that too for 10 to 30 years, as per Guha, one of the few researchers in India who have studied the crop and its productivity. He calls betel farms household banks. Although betel cultivation began in India 1,500 years ago, the country has not improved the cultivation technique since, nor identified its industrial uses, said Nikhil Kumar, retired scientist with NBRI. According to Kumar, the decreasing popularity of betel is the direct result of looking at the commodity based on its misuses and not its uses. “The first image that comes to our mind when we think of betel is the red spit and stains. But there is more to it. It has been scientifically proven that chewing of betel leaf releases adrenalin thus making the mind instantaneously alert,” said Kumar. The way paan is associated with India, a Chaurasia is associated with paan. But both the equations are changing, said Lalta Prasad Chaurasia, spitting blood red betel juice into an elegantly designed brass spittoon. The 58-year-old is among the last generation of Chaurasia farmers in Mahoba district of Uttar Pradesh who have witnessed betel leaves yield a fortune. Both betel leaves and the Chaurasias are an integral part of Mahoba’s history. The district is known for its betel gardens and the Chaurasias are India’s exclusive community devoted to betel farming. But they are now finding it difficult to sustain the family occupation. Till a decade ago, Lalta Prasad’s betel gardens extended over a hectare (ha). Now his son grows the vine on just a third of the farm. Kamlesh Chaurasia, another young farmer in Mahoba, has reduced his farm size to a decimal (0.004 ha) from nearly a hectare of betel garden he inherited a decade ago. “It is difficult to manage even this small patch,” he said. The region is suffering from seven years of drought. Once every three days, Kamlesh plucks tender betel leaves from his garden, neatly stacks them in a basket and takes them to a 200-year-old paan mandi (betel leaf hub) in the district headquarters. It is called Paan Bazaar. Till a decade ago, as many as 100 traders from across the country would visit the Paan Bazaar every day to bid for the famous Mahoba paan. But over the years the hustle and bustle has died down. The godown built to store betel leaves is in ruins. The paan shops around are mostly owned by people who have abandoned betel farming. But more than paan they sell gutkha, a concoction of areca nuts, tobacco, lime and flavours. 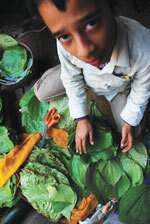 In 2005, the local betel leaf traders’ association decided to trade only thrice a week. “Since betel leaf cultivation has drastically come down, there was no need for a regular market,” said Rakesh Chaurasia, a member of the association. The market is now called subzi (vegetable) market. Betel cultivation is declining in the state, said D S Yadav, district horticulture officer of Mahoba. Uttar Pradesh is the largest consumer of paan and 15 districts grow the vine on 2,000-2,200 ha. In Mahoba alone, Yadav said, 800 farmers were growing betel on 180 ha in 2000. Just 234 are growing the vine on 80 ha this year. In Lalitpur district, the area under betel leaves has decreased by 20 ha in the past one year. “The continuous decline is due to several reasons beginning with extreme weather and shortage of water,” said Yadav. For instance, the sudden dip in temperatures between January 1 and 12 this year ruined over 80 per cent betel vines in Mahoba. Officials said the area under betel cultivation is set to shrink further because farmers are now left with very few cuttings to begin a new crop. Once planted, the perennial crop can be harvested for four-five years. The trend of chewing gutkha has also influenced the fall in demand and cultivation of paan, Yadav added. Betel leaf is not losing its charm for farmers in Uttar Pradesh alone. A few hundred kilometers away, another Chaurasia has severed his traditional link with betel leaves. Guruprasad Chaurasia’s father had left his ancestral home in Gorakhpur in Uttar Pradesh in the 1950s to make a career in the booming betel leaf trade. Jaleshwar town in Balasore district of Odisha gave him a head start. But within a generation, Guruprasad is out of the family trade. He now repairs televisions and runs a grocery store. Till a decade ago, Guruprasad recalled, scores of supply agents would procure the Jagannathi patta (leaf) from farmers in Jaleswar and supply to paan mandis in Lucknow, Varanasi, Mumbai and Delhi. The supple variety of betel is grown on the sandy soil of Odisha within half a kilometre from the coast. Its cultivation was strengthened by the arrival of businessmen like Guruprasad’s father from Uttar Pradesh in the 1950s. During the mid-1980s, a family could earn as much as Rs 20,000 a month from a three decimal farm, or baraj as it is called after the migrant Barajia community from West Bengal who introduced betel cultivation in Odisha. That was the time when even fishers set up betel farms in their homestead land. About 3,000 baskets, each stacked with 2,000 leaves, were traded daily in the entire Jaleswar town, recalled Guruprasad. Unsure of prices, agents now hesitate to send even 50 baskets, he added. “Prices nosedived in the past couple of years. I incurred a loss of Rs 2 lakh in 2008 and have since shifted to a pucca (proper) business. It’s no longer fashionable to chew paan. The young generation likes gutkha and cigarette,” Guruprasad said, artfully tucking a paan in his cheeks. Guruprasad is not the only victim of the shrinking market. In 1990 more than 200 supply agents were operating out of Jaleswar. Only 15 are still in the business. They have mostly confined their business to the processed form of betel leaf, called the Banarasi patta. It commands a high price in the market. Processing the Banarasi patta is a delicate task. One has to neatly pack the leaves in a cane basket after a generous sprinkling of water and cover them with wet jute bags. The basket is then put in an oven with charcoal burning in one corner. This is called paan bhatti. As heat de-humidifies the leaves after three rounds of heating and cooling, they turn pale yellow and thin. They last longer, for up to a month. The processing also imparts a sweet taste, making it a favourite among connoisseurs. Declining betel demand has also affected the processing units. Barely five of the 100 paan bhattis in the town are operational. Afsin Ali, 40, is one of those who burnt their fingers in the processing business. In 2007, he invested Rs 5 lakh from his hard-earned savings and borrowed from betel farmers to set up a paan bhatti. He made a profit of Rs 1 lakh in the first year. But the market crashed during the summer of 2009. “Since production goes up during summer, the market usually slumps. But that year it was unpredictably steep,” said Ali. He received only Rs 5,000 for the Rs 40,000 worth of consignment he had sent to paan mandis in Uttar Pradesh. At times the consignment would rot and he would have to shell out Rs 1,000 to dispose it of at a garbage dump. Last year, he gave up the business and started working as an insurance agent. Wholesale paan markets across Uttar Pradesh, West Bengal and Delhi retell the story of India’s diminishing status as the largest betel leaf producer and consumer. Take West Bengal that accounts for two-thirds of the betel production in the country. Its Bangla patta is famous for the spicy taste and is in demand from several Asian countries, including Bangladesh. But bookings for Bangla patta have gone down by half in the past 10 years, said Chandi Charan Samanta, secretary of the traders’ association of the auction hub of Mechheda in East Midnapore district. Earlier, traders from Delhi and Mumbai would book consignments every day. But these days they make bookings on alternate days and at times even twice a week, Samanta added. Rajeev Goel, member of the Delhi paan traders’ association, offered a few figures. Till 1998, the Delhi Paan Bazaar, that supplies betel leaves to the entire city, received 8,000-10,000 Banarasi patta baskets every day, each carrying 1,000 leaves. By 2005, the market received 9,000 baskets only five days a week. The number has decreased further to 8,000 thrice a week since 2008. 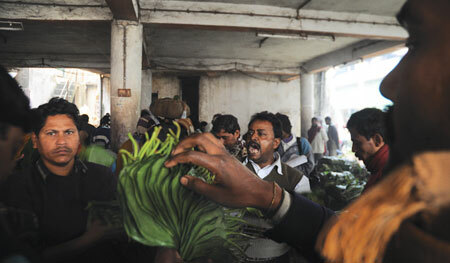 Betel trade has fallen by 35 per cent in Uttar Pradesh, reckon traders’ associations in Lucknow. The district has the second-largest betel market in the country after Varanasi. Farmers prefer to grow crops that give assured returns, said Shyam Prasad Chaurasia, owner of the paan mandi in Lucknow. At least 200 farmers who used sell betel leaves at his mandi have shifted to other trades in recent years. As per the Economic Survey of India, about Rs 800 crore worth betel leaves were traded in 2000. The trade has dipped by 40-50 per cent since, say traders’ associations of Uttar Pradesh, West Bengal, Odisha and Delhi, though there is no official record. “Data on betel is not collected as it falls in the unorganised sector,” said Jose Samuel, chief consultatnt at National Horticulture Mission, Delhi. Last decade is also the period when India witnessed a sharp increase in the consumption of chewing tobacco, especially gutkha. According to Euromonitor International, a London-based market research firm, 484,000 tonnes of chewing tobacco was sold in 2004. The sale went up to 639,000 tonnes in 2009. Break down the amount into six grammes, which is the standard weight of a tobacco sachet, and India consumed 80 billion tobacco sachets in 2004 and 120 billion in 2009. According to WHO, 45 per cent adult Indians were hooked to smokeless tobacco consumption in 2009. Gutkha invaded the Indian market in the 1990s. At roadside kiosks it is as ubiquitous as tea. The success of the Rs 10,000-crore gutkha industry is due to its easy availability, smart packaging, high shelf-life and low prices; the rate of a sachet has been Rs 1 over the past 10 years. Besides, paan is a varying commodity, while gutkha has a uniform taste, said Subhash Gupta. Once a paan seller, Gupta now sells gutkha in Delhi’s Paan Bazaar. As many as 80 paan sellers in the market have shifted to selling gutkha in the past decade. Betel vine farming/trading is important for another strategic reason also. It must be the only crop where the farmers still play a role in determining the cost of the end product. In Tamilnadu, every day, based on the arrival of the betel vine, Sholavandaam (a major betel growing area) farmerÃ”Ã‡Ã–s federation determines the price in consultation with the other major trading / growing regions and mobile phone has ensured that the different regions have their wholesale and retail price adjusted to the current price at the production centre. Also, in tamilnadu some of the costs mentioned in the article do not hold good, as farmers use muringa and greens as shade giving inter-crops in the beten vine gardens. In the production mandis it is a common sight to see the betel leaves harvested in the morning and the inter-crop harvested in the afternoon both fetching a decent return for the farmer. They have also devised methods such as raised beds for the betel vine and some very innovative implements that are only seen in the betel vine parts for their usage. However, places like Aathur (near tutucorin) which is another major betel growing area, have other problems. Despite the betel farmers getting special status for irrigation from the government through a GO several decades ago, the heavy industries downstream have long since taken government on their side and the irrigation of these farmer fields are low in the priority of the government in comparison to that of the industries, where much of the water is diverted rendering this profession not too welcome. Athur in fact has an interesting betel vine farming community with assets, quality control and standards and measures all controlled by the sangham of the farmers (and unless one is cultivating betel vine for the current season, one cannot be a office bearer in the sangham!). We had studied the betel vine in the state a few years ago and it is one of the most innovative and dynamic farming groups and remains significantly organic. In fact, one of the office bearers of the major Sholavandaam betel vine farmers association had informed us that they have managed to remain organic because they are not associated with government agri departments or universities! For some strange reason, betel leaf is categorized under horti-culture department by the government of tamilnadu. I donÃ”Ã‡Ã–t know what is the current status, but, it would be interesting to re-visit some of these places and understand the issues involved. market. Please understand that TN betel leaf does not go beyond the state of TN. We are renowned betel farmer in Bangladesh for last 80years,my grandfather, now my father and me.